This past weekend, my friends and I threw a bachelorette party for a sweet bride to be! We planned for weeks, coordinated outfits, and went on and on about how much fun it would be. And it totally lived up to every expectation! 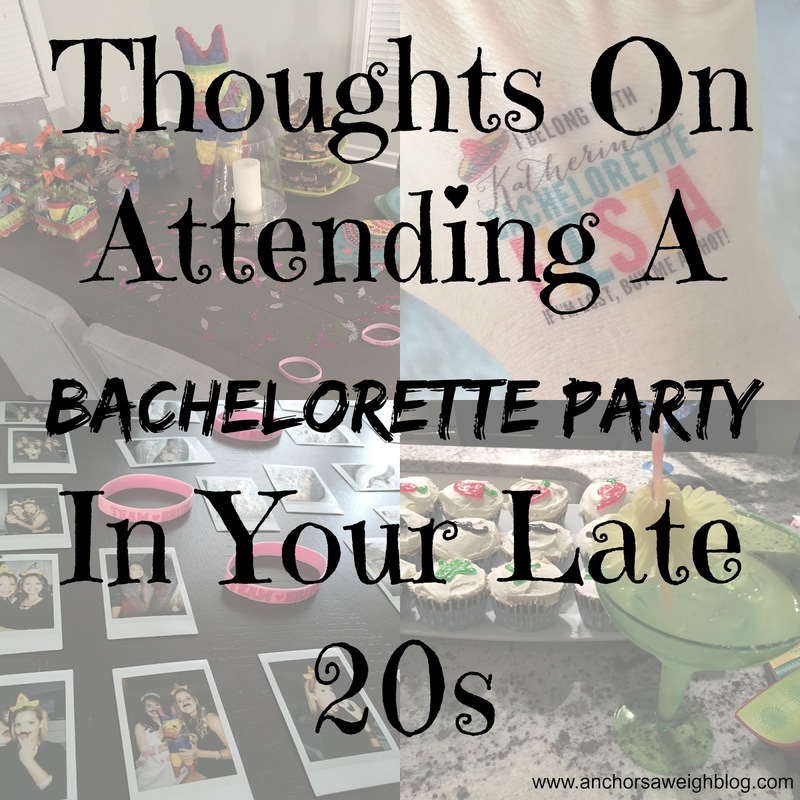 It's been a few years since I attended a bachelorette party, so I thought it would be fun to share a few thoughts on the night as told by someone in their late 20s. Side note, why can't I still be in my early 20s?! Insert crying emoji here. Mexican theme. Always go with the Mexican theme. Guacamole, mustaches, guacamole, pinatas, and guacamole. Enough said. But did I mention the guacamole? Instead of alcohol, you are drinking all the water. You know what those beverages do to you and you aren't allowed to sleep all day the next day because you actually have to adult. The pre-party goes until 11 PM, and then you will transport to the bars. Must prepare mentally. You do not get to go to bed at 11. I repeat, you do not get to go to bed at 11. Going to the bars in a group of all girls vice going with your husband/boyfriend/whatever is a very different experience. The bars play a disappointingly low number of Taylor Swift songs. Prepare yourself for the struggle. Why can't it be cool to wear sneakers to a dance club? Dancing until 2 AM in sky high heels is for the birds! When you finally get home around 3 AM from an epic night of dancing the night away, you will be faced with the grueling choice of sleep versus food. You choose food. Obviously. You remember that your husband and pup have been asleep for hours and sincerely hope said husband remembered to feed them both dinner. You've had your food and are ready for bed! It's 4:30 AM. You set the alarm for 8:30 AM, because remember what we discussed at the beginning? You actually have to adult tomorrow. 8:30 AM, how on earth did you get here so quickly? You may be sleep deprived and completely delirious, but you are so thankful for girlfriends. A girl needs girlfriends. Boom. End of story. Sounds like you guys had a great time!! :) You can never go wrong with a Mexican theme. I haven't been to a bachelorette since my early 20's. I'm not married, but I've basically told my friends, if they love me, they'll take me to an amazing dinner, we'll watch an awesome movie, and avoid clubs and strip shows like the plague. And Guacamole is awesome, so that almost makes the night amazing before you hit the club. Oh my gosh yes to all of this!!!!! I haven't even started thinking about my bachelorette party!! I need ideas for something fun but affordable. Ohh, wow. I definitely couldn't make it until 3AM anymore, haha. I've always been an early sleeper, though, so I'm not lying when I say I had to REALLY try hard to stay up late in college... I KNOW I couldn't do it now! "I repeat, you do not get to go to bed at 11." Hahaha! I just went out for the first time in forever and was SO tired, but had a friend in town. I seriously had to keep telling myself that! Yes to all of this, especially the bed time. By the time my friends manage to get married, we'll be pushing if not already 30. Just the thought of that is exhausting.